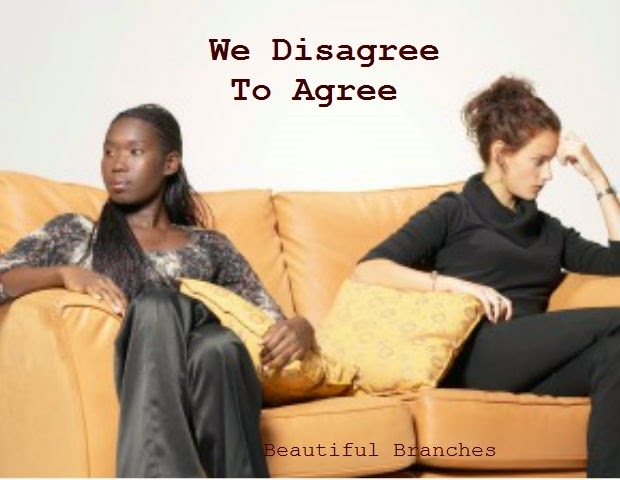 For any relationship at all to thrive, the partners must learn the principle of disagreeing to agree. By the reason of our individual diversity and uniqueness, there will always be reasons to disagree with each other’s opinions. It is just normal that people don’t always have exactly the same opinions about every issue. Paul encourages us to act like Jesus. We must work towards pleasing others rather than ourselves. Romans 15:3 tells us that even Jesus did not please Himself. He gave up His rights to save us. We are to imitate Christ. We must love others as we love ourselves. We must know that we can not always win arguments. Love does not seek its own. Love looks out for the good and happiness of others. If love motivates us, we would easily let go of issues that cause disagreements between us and our brethren (or sisteren). We must be sensitive to those around us. Having said that, we must decide to keep in perspective what we are disagreeing about. The issue is the problem not your spouse, sibling or friend. Deal with the problem at hand and seek to come back together as a united force. A little compromise (definitely not a compromise that’s sin) might be all you need. Focus on the issue being trashed out not on trashing that person. I pray that God’s love will fill our hearts. May God mend every precious relationship that has been broken because of inability to manage disagreements in Jesus’ name!